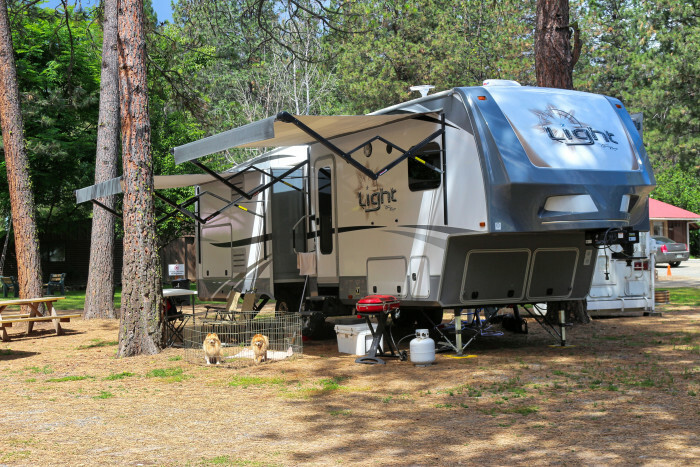 Ask fellow campers about "North Lake RV Park and Campground" and nearby attractions. Very dusty. Sites were very tight. The new owners are trying but things keep breaking. They need to water the road when no rain. We camped at North Lake RV Park and Campground in a Motorhome. This is a great place to get away! Yes, the tall pines will cut off your satellite TV. Yes, it is down a dirt road. But really. Why do we camp? This is one excellent place to escape from "stuff". Bring a fishing rod. Bring a kayak. Bring a boat. We had a full hook-up pull-thru site that was actually easy to enter and exit. The tall pine trees protected us from the winds. This is an older campground with new owners who are working hard on many upgrades. 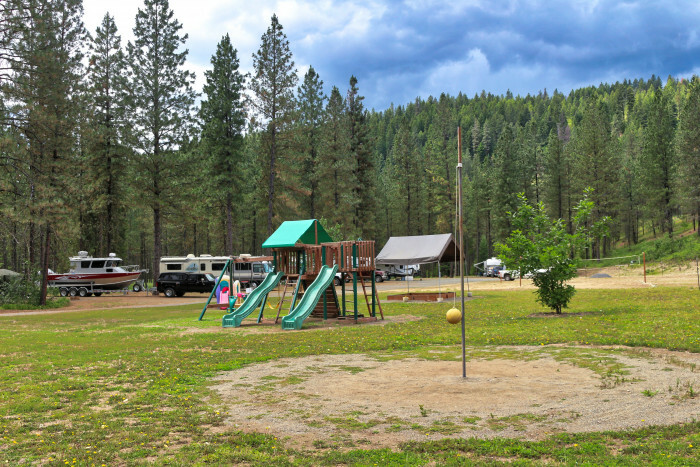 RV sites are scattered among the trees and not lined up in rows. The sites are dirt and gravel. Sites offer plenty of room between sites with picnic tables and fire pits. Water pressure was good, and no problems with the electricity. A large grassy common area is adjacent to the RV sites and is complete with awnings, chairs, and tables. There is not a fenced dog park, but there is plenty of area to walk leashed dogs. That said, they do request not to take dogs into the grassy common area or the playground area. The new owners are very friendly and want to help make one's stay nothing but enjoyable. We will return because this campground has so many great things working for it. We camped at North Lake RV Park and Campground in a Fifth Wheel. Take a drive over to Republic, WA and visit the Stonerose Fossil Site. For a minimal fee, one can dig for Eocene fossils all day! Look at the campground website for directions to local waterfalls and motorcycle scenic rides. 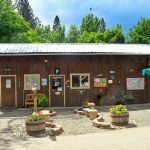 Visit the Kettle Falls Museum to learn about the Falls (under 150' of water now) and the history of the area. Yes, it is a small, local museum but well worth a visit. We stayed at the campground for 4 nights. The park was well maintained and very quiet. The owners and all their working staff were super friendly. They would bend over backwards to remedy any problems you have. There are lots of pine trees so satellite tv is a problem in most sites. 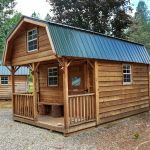 Cabins to rent. Restrooms. Coin op showers. Laundry room. Several trails to walk on for exercise or to walk your dogs. 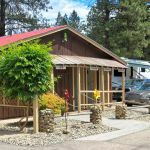 We would recommend this rv park to anyone looking for a great place to stay. We will be back! We camped at North Lake RV Park and Campground in a Fifth Wheel. What a nice RV park. The owners were very friendly and helpful. The park is set in the pine trees with many dog walking trails. One thing we liked about the park is the wide open spacing. We had no trouble navigating into our RV spot. All of the utilities worked well, however we couldn't get any TV or internet. The only thing negative I could say about this park is the road into it. There's about half a mile of dusty road to get to it. 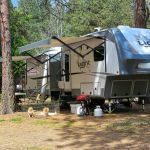 We camped at North Lake RV Park and Campground in a Fifth Wheel. This park in on the Kettle River with trails to the river. The park was clean and the owners friendly. We were there for 8 days and it was very enjoyable. The park is in the tall pine of northern Washington. We camped at North Lake RV Park and Campground in a Motorhome. There are museums in town, Coolidge was about 16 miles for shopping,and Lake Roosevelt is with in 7 miles for large boating, or small boating. Many of the sites, including ours, were nestled among tall pine trees providing a calming, off-the-grid ambience. A short walk through an adjacent pine forest was an arm of Roosevelt Lake in which to boat or swim. The park also offers a large screened gazebo and other facilities for group activities such as multiple covered tables alongside barbecue equipment. 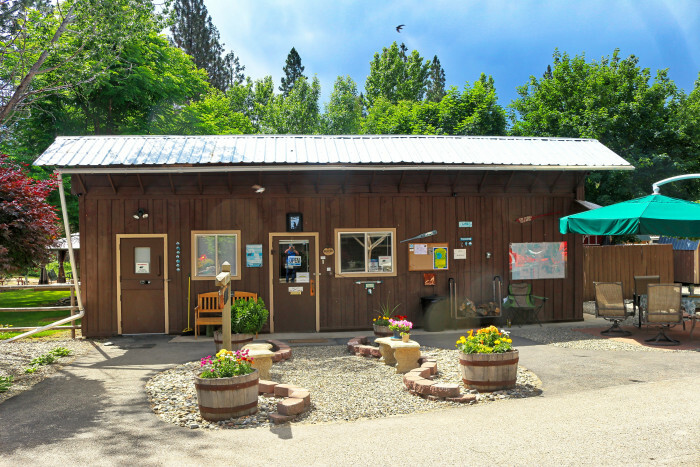 A handy parksite store with convenient hours. A ton of DVDs to rent for $2.00 per night. Great attention to detail. The hosts were particularly helpful when we had to take our tow vehicle into town for transmission repairs. They picked me up when I dropped the truck off (16 miles away) and drove me back into town when the work was complete. Very friendly and helpful. We heartily recommend a visit. 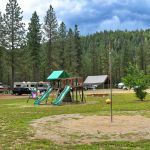 We camped at North Lake RV Park and Campground in a Travel Trailer. 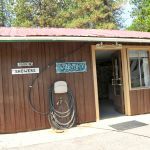 We visited the towns of Kettle Falls (small but scenic) and Colville (larger and alive with many available services including a number of good restaurants). We also took a short drive into British Columbia (make sure you have your passport and fill up with fuel before entering Canada). We visited the towns of Castlegar (where we viewed the Kootenay River joining the Columbia River) and Nelson where we enjoyed a fine lunch and excellent Canadian brew. Very friendly people. Owners available for any needs. Very peaceful, quiet location. It is a little gem. Great place to relax. We camped at North Lake RV Park and Campground in a Motorhome. We ATV rode right out of camp. Fishing was available. A walking path out of camp lead to beach on lake. You have a nice views. I think of this place as for families and some nice R & R. There also is a playground for kids. Nice grassy areas with covered area for group barbecue. Owners very friendly and helpful, easy check in and owner walks you to your site and will assist if needed. Many large pine trees. Fire-pits and tables with each site. Sites are full hook-up, gravel and quite level. WiFi is decent, only sat TV if you can find a spot thru the trees. Play ground, community BBQ, screened gazebo, laundry, cabins and large grassy area. Short walk to the Kettle River but with limited access. RV sites a little confusing and if the campground was full it would be a little tight. Separate tenting area. Washrooms and showers were adequate and clean. We would stay there again. Good Sam discount available. We camped at North Lake RV Park and Campground in a Fifth Wheel. New owners in the last 3 years. Very friendly and accommodating. They are constantly making improvements to a park that was previously run down. We stayed here one night and would certainly consider stopping here again if we are in the area. Of note, Satellite reception is tricky here. Scout your site if you want to use your dish. We camped at North Lake RV Park and Campground in a Motorhome. Nice park being updated and fixed up by new owners the past two years. They make it comfortable and clean. Sites are tight, dirt/gravel. In the trees so forget satellite TV unless you have portable unit. Those seemed to work fine. Short walk to the water. We did an overnight and it was perfect; longer might depend on your neighbors since you are so close. We camped at North Lake RV Park and Campground in a Motorhome. This is a very nice little campground that is being renovated by the new owners. 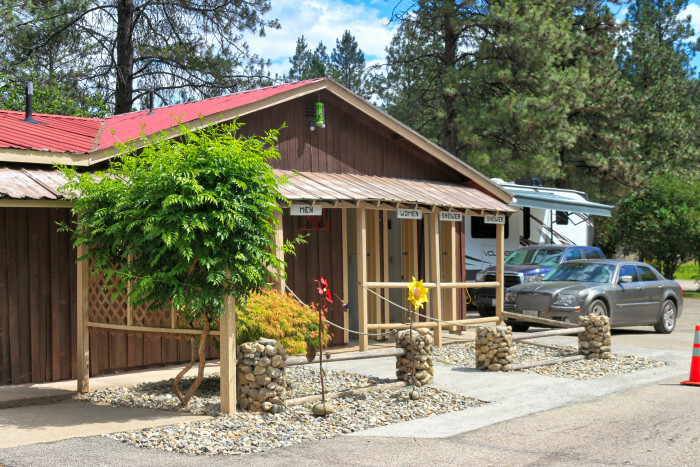 They are a Good Sam campground, and therefore, offer a 10% discount to members. Don't let the seasonal and long term residents discourage you as you pull in. Once you are in the park it is very well kept and beautiful. It sits near Lake Roosevelt which which is accessible by a short nature walk. Paddle boats can be rented at the office. 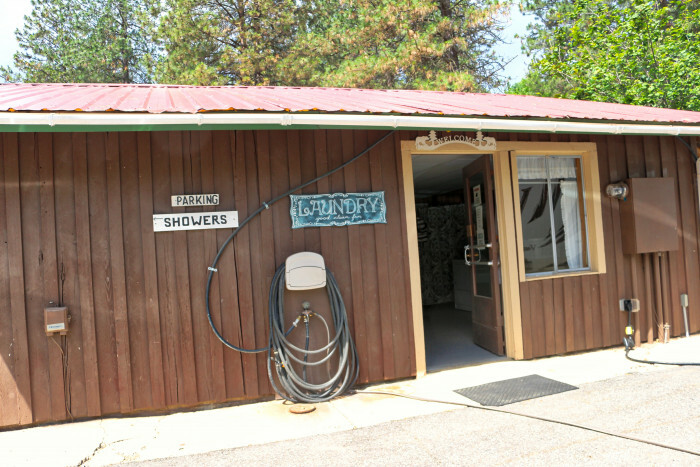 The campground offers older, but very clean restrooms, showers, a camp store, and a laundry facility. There is also a beautiful grassy area with playground equipment, horse shoes, and a BBQ. There are a couple of group fire pits and each of the RV sites has its own fire ring. There are pull through sites available and lots of shade. 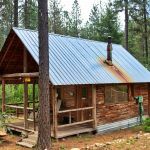 They also have the cutest little cabins for rent which was nice when we had friends visit during our stay. The owners are very nice and went out of their way to make our stay enjoyable. We would definitely come back! Very quiet and peaceful. We camped at North Lake RV Park and Campground in a Motorhome. 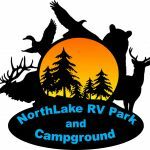 Are you affiliated with North Lake RV Park and Campground ?